You have stumbled upon the very BEST and most reliable tried and true scratch cake recipes for wedding cakes, birthday celebrations and more. 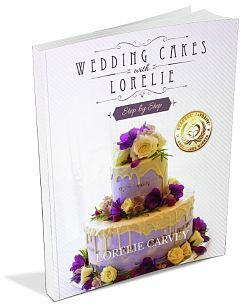 Build your skills and confidence with the steps and recipes in my book "Wedding Cakes With Lorelie". Imagine creating beautiful tiered cakes and cherished memories for family, friends and clients? I've compiled my best recipes into one book for you. These are the exact recipes I use to WOW my brides every time. "I used your recipes for the bridal cake I made for my niece (My first). The bottom layer was butter cake with raspberry filling, middle was carrot cake with cream cheese, and the top was your chocolate cake recipe with the raspberry filling. All of your tips on the site were awesome too! That butter cake was the best ever...all of them were! Thank you for generously sharing your best wedding cake recipes with everybody! I will never forget your site, and I have told many people." The best moist banana cake recipes including a tropical version with pineapple and my favorite, the super simple butter cake with whipped cream and sliced bananas. The VERY BEST recipe for carrot cake. Even people who think they do not like carrot cake rave about this one. It's amazing how incredibly yummy and delicious this recipe is. "I just wanted to let﻿ you know I made recipe over the weekend and it came out GREAT! My whole family loved it! And certainly those that didn't care too much for carrot cake - loved this one". Among the best wedding cake recipes are my favorite cheesecakes. These are great for pastry tables as an extra dessert or for any occasion. Creamy New York Style with a graham cracker crumb crust, a sinfully rich chocolate one with a chocolaty crunchy crust and Juniors recipe. Yes many brides and grooms are choosing chocolate for their special day. The guests love it! A seriously awesome chocolate buttermilk recipe (simply the best and the easiest) Also included is a triple chocolate combination a chocolate stout and a dreamy chocolate orange combo. ENJOY! This is a taste of heaven. Combine it with pineapple or lemon filling and lots of coconut cream cheese icing for an incredible experience that you will not forget. This is a great addition to the wedding cake recipes. An English favorite! The rich fruit cake is a hardy one made with oodles of fruits and nuts along with a good soaking of Rum, Brandy or Orange juice if you prefer. The bejeweled tortes are then left to age and await their final coat of Royal Icing and Marzipan. Sweet!!! Basic fruitcakes were once the traditional brides cake in Roman times. It was crumbled over the brides head to bless her with abundance. This tradition was known as "crowning the bride". Luscious lemon cake with English lemon curd filling and a tangy lemon buttercream. If you like citrus you will want to try this combination. There is a sunny yellow ombre cake design pictured there for you too. Madeira Cake is an English recipe that is very much like a pound cake, but it does not have Madeira wine in it. It was originally meant to be enjoyed with a glass of Madeira wine. It is especially good for shaping and cutting and to use with heavy icings and fondant. Even though these are cookies I decided to add them to the best wedding cake recipes page because they are a favorite for a pastry, dessert or banquet table. Some call them sandy tarts but they are also known as Russian tea cakes and make nice party favors. If you are planning on offering additional desserts to your guests then you should try these little confectionery gems. "I am so happy to have found your website. I used to live in Danbury and you used to make the most delicious birthday cakes for my daughters birthday celebrations over 15 years ago!!! I have never forgotten those cakes. It was a orange cake with a white chocolate buttercream frosting and fresh whole raspberries in the filling, very dense, moist DELICIOUS cake. Best we have ever had!!!! My BEST orange recipe. This recipe is quite often ordered by the bride and groom after a taste test. Combined with fresh or individually frozen fruit and white chocolate filling, it is amazing and so moist and delicious! This nutty and butter infused cake is amazing. If you like nuts this one is for you. Makes a great cake for any occasion. A homemade red velvet cake recipe for you from one of my readers. Not quite chocolate nor vanilla, but somewhere in between. It is interesting to cut into with its bright red color and contrasting creamy frosting. Your guests or your bride and groom clients will not be disappointed. The filling and frosting that Robin shares is also unbelievably good. Check it out. If you are looking for a pure snow white cake than this is your recipe. The perks of using this is the ease of which it is prepared. Simple and delicious and can be combined with almost any filling and frosting recipe here on the website. The symbol of purity and the most traditional, the majority of wedding creations still tend to be white cakes and the grooms cakes chocolate. The best collection of wedding cake recipes starts with a classic white cake recipe. This one is made using whipped egg whites for a lighter batter. NOTE This is not a pure white cake. If you want a strictly white cake with no egg yolks or butter try this NEW addition to the site. The flavor is a rich and it is a little bit easier to make than white because you don't have to fold the delicate egg whites carefully into the batter. This one is not as light as the white one but easier to prepare. Gluten free cake expert Michele Owen shared her version of my coconut carrot and chocolate cake recipes with us. I have made the chocolate and it is absolutely yummy. Read what Tammy says about the coconut. "The cake was delicious! I'm making the gluten free coconut wedding cake for a nephew with celiac's, the sheet cakes for the guests will be the regular coconut cake, his fiancé & family tried both & loved them!"